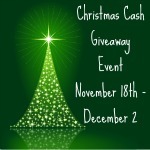 The Christmas Cash Giveaway event is finally here, hosted by Mommy’s Moments. 1st Place Prize is $200 PayPal Cash and 2nd Place Prize is $25 PayPal Cash!! One Rafflecopter entry form will be located on the participating blogs from November 18 to December 2nd 12:01 AM EST. Make sure to not duplicate your entries, I will be going through and checking and deleting those. *** I can't get my Rafflecopter to work so please enter at Mommy's Moments- thank you.